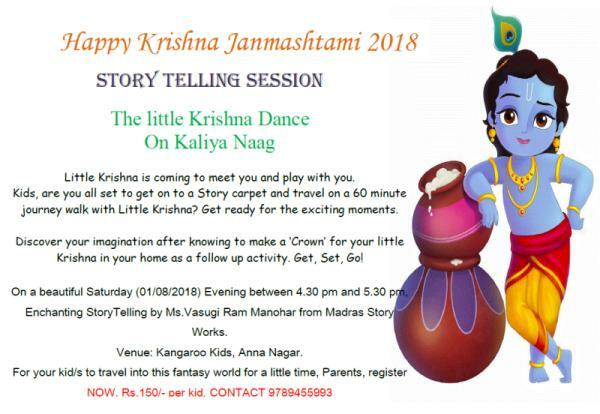 Krishna Janmashtami Story Telling session on Sep 1, 2018 . Little Krishna is coming to meet you and play with you. Kids, are you all set to get on to a Story carpet and travel on a 60 minute journey walk with Little Krishna? Get ready for the exciting moments. Discover your imagination after knowing to make a ‘Crown’ for your little Krishna in your home as a follow up activity. Get, Set, Go! Enchanting StoryTelling by Ms.Vasugi Ram Manohar from Madras Story Works. Venue: Kangaroo Kids, Anna Nagar. For your kid/s to travel into this fantasy world for a little time, Parents, register NOW. Rs.150/- per kid.